More than 100 crafters and artists from near and far -- and an almost perfect weather forecast -- makes the 42nd Annual Schroon Lake Arts and Crafts Fair the place to be Saturday. And did we mention the food, music, silent auction and ducks? (more about the ducks later) The fair, sponsored by the Schroon Lake Association, those terrific folks dedicated to preserving our piece of paradise, will be at its usual digs at the Town Park, starting at 10.00 am. 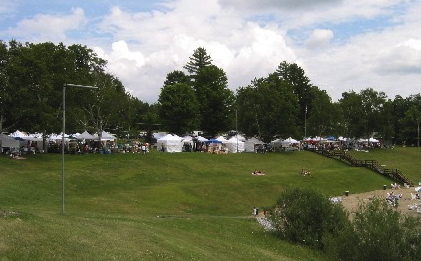 “There will be something for everybody... all the arts are represented…jewelry, sculpture, woodwork, photography, painting, you name it, it will be at the fair,” Director Georgia Burkhardt told Schroon Laker. “We have artists from Montreal, New York City and and a wicker furniture maker coming from Florida. And all of the local area artists from here and close by will be there”. The festival, known for its high quality vendors, will have 105 booths this year, down slightly from last year’s 115 exhibitors. And if there’s a favorite artist you want to catch up with, chances are they will be in the same spot as previous years. Now about those ducks – please consider adopting one. Not the quacking kind, but the ones that will float merrily down the stream, with your lucky number on it, and win you some cash, come Labor Day weekend. It’s the Schroon Lake Association’s Duck Race fundraiser. Tickets are $5. Proceeds from the Duck Race, as well as the fair, go towards the efforts of maintaining the heath of our lake, hiring a lake manager and funding scientific studies of the lake. Check out the Association’s booth and consider joining the association. And while you are there, give Linda, the Duck Mascot, a quack for us.